unintentional poisoning deaths in North America. 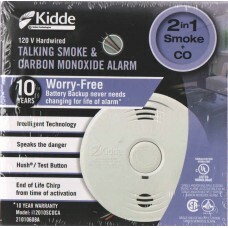 The combination smoke and carbon monoxide alarm shall be Kidde model i12010SCOCA or approved equal. It shall be powered by 120 V AC, 60 Hz source with one 3 V sealed lithium battery backup. The temperature operating range shall be between 4.4˚C (40˚F) to 37.8˚C (100˚F) and the humidity operating range shall be 10%–95% relative humidity, non-condensing. The unit shall incorporate an ionization smoke sensor with nominal sensitivity of 0.75 ± 0.25 %/ft. The CO sensor shall be of a fuel cell design and shall meet the sensitivity requirements of CAN / CSA 6.19-01 - Residential carbon monoxide alarming devices. The alarm can be installed on any standard single gang electrical box or a 4” octagon junction box. The electrical connection (to the alarm) shall be made with a plug-in connector. The unit shall provide optional tamper resistance that deters removal of the unit from the wall or ceiling. No additional pieces shall be required to activate this feature. A maximum of 24 Kidde devices can be interconnected in a multiple station arrangement. The interconnect system must not exceed the limit of 18 initiating devices, of which 12 can be smoke alarms. With 18 initiating devices (smoke, heat, CO, etc), interconnected, it is still possible to interconnect 6 strobe lights and or relay modules. The convenient choice for combined fire and carbon monoxide protection in a single alarm that talks. •Combined Smoke & Carbon Monoxide Alarm – A single unit can be installed where previously, two were needed. 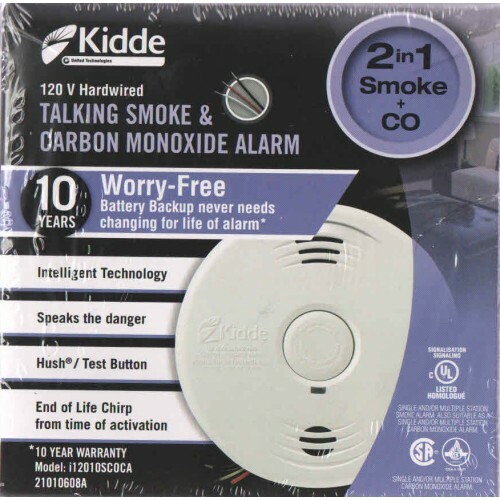 Reduces installation time and protects against both fire and carbon monoxide dangers. •Intelligent Sensor Technology – Combines the detection capabilities of a ionization smoke sensor with that of an electrochemical sensor, which is used to detect CO. When either sensor notices a potential hazard, the alarm will adjust its smoke sensitiivity to differentiate between a real hazard and a false one. •Voice Warning – Announces the hazard type detected (in both English and French). Alarm announces “Fire! Fire!” when a smoke or fire hazard is detected and announces “Warning! Carbon Monoxide!” when a CO hazard is detected or “Low Battery!”. •120 V Interconnectable – Will interconnect with up to 24 other devices (18 of which can be initiating), including smoke alarms (limit of 12), CO and heat alarms. •10-Year Sealed Lithium Battery Backup – Eliminates the need to replace the battery. No battery to replace for the life of the alarm (10 years). Battery backup automatically activates when the alarm is attached to mounting bracket. •Hush® Feature – Temporarily silences nuisance alarms for approximately 9 minutes (smoke must be present before Hush® is activated). •Test Feature – Simultaneously tests the unit’s electronics and verifies alarm operation. •Tamper Resist Feature – Unit will lock to mounting bracket to deter theft or tampering. •End of Life Notification – Ten (10) years after unit is first powered, this alarm will chirp twice every 30 seconds to indicate it is time to replace the alarm. •End of Life Hush Feature – Allows you to temporarily silence End of Life chirp 3 days at a time for a maximum of 30 day life extension.